Have you ever done a great video with your kids and lost it? I have. In fact I did an awesome video for this very product along with some great photos of the product as we were opening them up and now I have nothing. Grr...this is what happens when you lend the computer to your kids. Changes will be made but I digress because this is not a post about my kids and my computer but about fitness for kids. 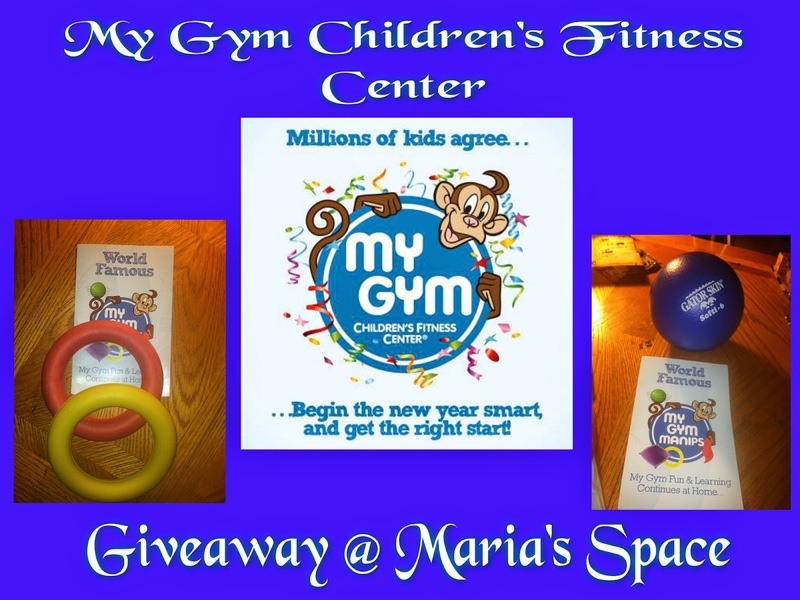 My Gym Children's Fitness Center is a worldwide privately owned companies that focuses on children's fitness classes, birthday parties, camps and other special events. Unfortunately there are none near me. My Gym looks like a lot of fun for kids 6-13 years of age that is run by dedicated fitness pros who want to show kids how to keep moving and have fun. Looks like a great time right?! My kids would love to have a party here. If you go to My Gym or if you don't have one near you, there is still a way to get kids moving. Get them off the couch, away from the computer, iPad or Kindle. They need to keep moving because good habits start early and I am in dire need of more ways to get my kids away from the outlets. Check out these My Gym Products. Valued at $9.95. Now parents and children can extend the benefits from elements of My Gym’s unique program by bringing home the foam rings we use in class. 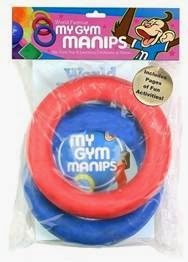 This set of two foam rings is sealed in retail packaging with an exclusive My Gym insert containing activities that enhance children’s My Gym experience, further develop semi-complex skills, increase fine and gross motor skills, and expand imaginations. Valued at $13.95. 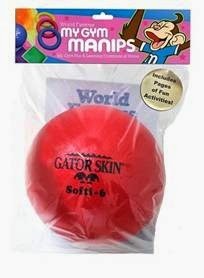 Now parents and children can extend the benefits from elements of My Gym’s unique program by bringing home the Gator Skin Softi Foam Ball we use in class. This ball is sealed in retail packaging with an exclusive My Gym insert containing activities that enhance children’s My Gym experience, further develop semi-complex skills, increase fine and gross motor skills, and expand imaginations. In the video that is now missing I spoke about how my son who started OT at the age of 3 had fabulous Occupational Therapists who used these very items to help him with his motor and fine motor skills. The video contained my kids doing activities from the activity cards that came with the ball and rings and having a blast. Put it in front of your face and pretend it is a frame. Now do sad, happy, funny, etc faces. Lie on your back and hold the ball with your feet. Pass it to your hands and back or pass it to another kid and back using just your feet. 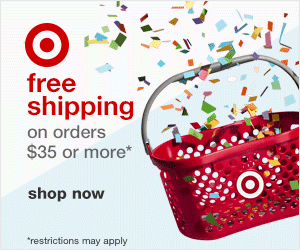 The ball and rings came with three detailed pages of activities to improve physical skills, hand-eye coordination and fine and gross motor skills. You are only restricted by your imagination. 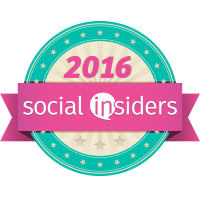 My son's Occupational Therapist asked for a link to the site so she can check it out and you should too! Find out of there is a gym near you. You can even get a free class to check them out. Established in 1983, My Gym is a leading fitness center destination for children with more than 260 locations worldwide, including international locations in China, France, Canada and Brazil among others. More than 30 additional locations are planned to open worldwide in the next 12 months. My Gym combines innovative, early physical education/pre-gymnastics classes with state-of-the-art facilities to empower children - ages 6 weeks to 10 years - by helping them acquire the skills, confidence and positive self-image needed to become healthy young adults. 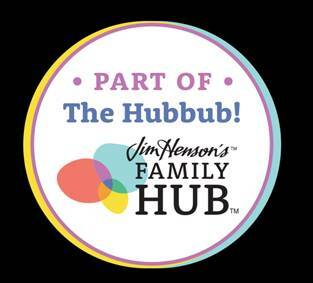 My Gym’s award winning, structured, noncompetitive, and age-appropriate classes and children's birthday parties enhance children’s overall development through games, music, exercise, sports, gymnastics, puppets, special rides, and fun. The children gain strength, balance, coordination, fine and gross motor proficiency, agility, flexibility and social skills. 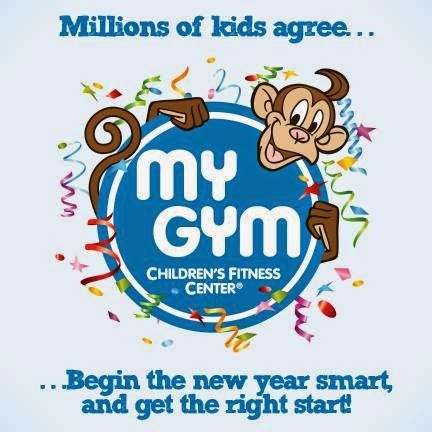 Check out My Gym Children's Fitness Center's new FREE app. BabyFirst and My Gym have partnered to create an exciting new My Gym at Home app, initially debuting on iOs devices with Android not far behind. Kids are having a blast using smartphones to make Mymo do fun exercises simply by touching the screen. Also, users can paint fun pictures with the flick of a finger, or watch exciting episodes of BabyFirst’s My Gym at Home! BabyFirst is the broadcast home of the popular baby/toddler fitness show, which features My Gym instructors guiding children and parents through songs, dances, and fitness routines culled from My Gym’s award winning curriculum. I learned My Gym was started in1983. They have over 1,500 trained instructors! Parents can participate in a discussion about their child's development and milestones while taking the class for ngestiqi infants. I read that A child who feels good about him/herself has a jumpstart on the path to success. This very interesting. I need to check it out more. I learned that they have a variety of programs to empower children.